French Emblems: Emblem: Audito multa, loquitor pauca. Mustela foetum postea in lucem ore.
Diu at recocta parciùs prome ore. The weasel conceives her young in her ear, and afterwards brings it to the light of day through her mouth. Conceive your words through your ear, But remould and produce them at length through your mouth only sparingly. Mea renidet in domo lacunar. Link to an image of this page [F8v p96]minem ore parere scribit: similiter & Zezes. è cervice eius exstitisse, truncato illius capite. The weasel (says Plutarch in On Isis and Osiris), many people believe and assert, is subject to penetration, and conceives, through her ear, but brings forth its young through her mouth: and this has some similarity to how the things we say are born. 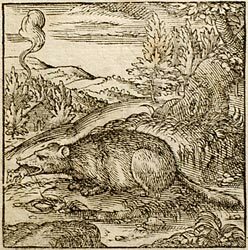 Anaxagoras and several other natural historians related that that the Weasel, just like the Ibis, gave birth through its mouth (this is according to Aristotle - On the Reproduction of Animals, book three, ch. 6 - where he pulls their story to pieces). Aristeas asseverates the same thing, just as he twists the meaning of the emblem a very little. For this is how his version goes: The weasel conceives through her ears, that which she will give birth to through her mouth. Consequently its consumption was forbidden to the Jews in Leviticus 11. As is implied in this emblem, it is a most pernicious habit in a man, to whip up whatever he picks up through his ears, into something bigger and worse by his exaggerated speech. Hugo Cardinalis, commenting on an earlier part of Leviticus, differs somewhat from the aforesaid opinions, saying that the male weasel procreates through his mouth, and the female conceives through her ear - how faithfully, he himself has seen. Horapollo writes that the mustelus, a similarly-named fish, [p.96] also gives birth through its mouth; so too does Tzetzes. This seems to be what is referred to by Lycophron in his very obscure poem on Alexander, when he calls the Gorgon Medusa deiropaida galên, that is, ‘throat-conceiving (or throat-childbearing) Weasel’, on account of the story which has Chrysaores and Pegasus coming into existence from out of her throat, when her head had been cut off. It is to this emblem that the words of the Stoic Epictetus refer when he warns that mortals are given but a single tongue by nature, and two ears: so that one should hear twice as many things as one speaks. It was a doctrine of Demonax (recorded by Lucian) that one should use one’s ears more often than one’s tongue. Epaminondas is praised by Pindar with this name, which otherwise would not easily have been thought of, since he knew much and spoke little. The meaning of the picture is self-evident. 1. Horace, Odes, 2.18.1-2. The Hipponactean is an iambic line, named after the satirist Hipponax of Ephesus. 2. De Iside et Osiride, 74.381A. 3. Isaac Tzetzes, 12th-century Greek grammarian. Lycophron, the Alexandrian poet, was (and is) particularly known for the obscurity of his style. 4. The Spartan general; see Emblem III ([FJUb003]).